Bishop Alan’s Blog: Pastoral Care: Good Shepherds? wandering aimlessly on the mountains and high hill… scattered over all the surface of the earth; with no one to search or seek for them. I myself will gather the remnant of my flock out of all the lands where I have driven them, and I will bring them back to their fold, and they shall be fruitful and multiply. I will raise up shepherds over them who will shepherd them properly, and they shall fear no longer, or be dismayed, nor shall any go missing. Be very afraid of pastors who have may faults, but being wrong is never one of them. Be very afraid of people in pastoral roles, for whom everything that happens in their lives is about themselves, not the other people involved. Be very afraid of people in pastoral roles who blame everyone else for their messes. And what of God’s shepherding for the sheep of his pasture the flock of his hand? Well, unless you have a few handy sheepdogs running round and round in circles, you can drive cattle, but you have to lead sheep. If you wave your arms about and make a noise at sheep, they become worried and run away. Drive them, their instinct is to spread out and there’s a great danger one or more will bolt. Many things drive us and pressurize us, especially in the high tech, litigious competitive South of England. Not God. And, I hope, not Church either. It’s important to remember this because there is a human tendency to create a god in our own image. Round here, that false god will often take the form of a demanding angry maniac, who doesn’t tolerate mistakes and works himself into a right old lather driving people to ever greater heights, usually, especially if we are Male, new heights of pretending, fantasy and BS. The False God will also, like as not, be a religious maniac. There is absolutely no evidence that the God and Father of our Lord Jesus Christ is any of these things. He leads where he has been before; he does not drive us. Therefore we are invited to follow him. There is no question of driving us or bullying us, playing hardball, or sorting us out. Just love. 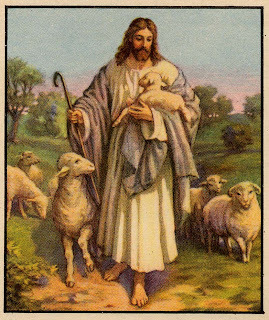 I am the good shepherd, says the Lord. My sheep know my voice. 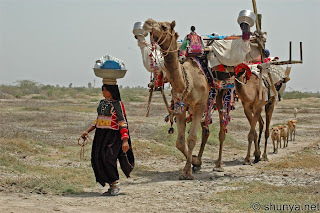 Here’s a picture of a pastoral community on a journey — Rabari nomads of Gujarat. What has this model to say about how we do Church as a pilgrimage, not an institution? Pilgrimage is the classic image of the people of God in the Old Testament, desert wanderers. This is how these people pastor sheep. In the daytime the shepherds take their flocks out into the fields, they all come together for the night. As many as five thousand sheep from several different flocks are crowded together. The shepherds take turns keeping watch. Some sleep while others patrol the perimeter of the whole enclosure. The patrolling shepherds bang their staffs and rattle things in the dark to scare away predators or thieves and to reassure the sheep that they are being protected. 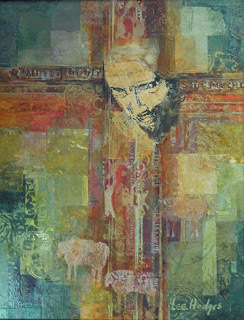 We are the sheep of his pasture, the flock of his hand. Think of the all the different voices we hear during each day, clamouring for our attention, angling for a response. Apparently we in the West are bombarded by three thousand advertising messages per day. Add to them the constant clamour of media voices, telling us what we should want, how we should live, how to measure ourselves against everybody else. . . this is the way to insanity! Our task, then, is to learn to recognise the shepherd’s voice, and thus to respond to his teaching; to model our ambitions and our lives on his care, and so to reflect it in all our methods — in other words to love our neighbour as ourselves. People look to pastors, ordained or not, for trust, compassion, stability and hope. These fruits are the measure of our work. Why did this Good Shepherd allow 250,000 of his sheep to be killed by a tsunami on 26/12/2004? Steven, dear bloke, you're just trolling. One reason your railing doesn't change anything much is that very few, if any, of the people whose religion you sneer at out of ignorance actually believes anyway in the kind of aunt sally deities you reject. The problem of pain is very important. But your theory that natural disasters are caused personally by Jesus, or even that anyone would ever think that, is bizarre. This is an example of an organisation which didn't take responsibility. Now poor United are 'suffering'. When the church fails to be a good shepherd the people take their custom elsewhere since people equate the care of the church with the care of God. Good customer service or shepherding is needed in business and in the church and with the reduction of people coming to church it has never been more important. Religion provides the answers science cannot. And the answer religion provides is is 'You are a troll' for asking such questions. But with the increased interest in atheism, the paucity of the answers provided by clerics is increasingly being spotlighted. I think Steven's question is worth addressing. Even in my Bible study group the same question has been discussed as Jesus surely knew about the tsunami beforehand. Could you please try to answers Steven's question from the Christians point of view (1 Peter 3:15)? Steven, I don't think religion is designed to be a kind of surrogate of post seventeenth century science, nor the other way round either. Evil and pain has for thousands of years been a foundational problem for by artists, poets, prophets, visionaries, the lot of us, almost all cultures. The Book of Job doesn't encourage the thought that a slick soundbite will solve it for everyone. The way in which people believe themselves to experience God as caring, or not, is deeply personal, not the kind of thing they are argued into or out of. We all puzzle about why disasters could happen — they say something very basic and disturbing about what we think the world is. It's also an area where it's far easier to see the shortcomings in others’ views than to feel entirely confident about one's own. Nobody's got an "answer" in any sinple sense. (2) That God was good but the world was evil and could be written off. Ancient civic religion produced simple fatalism. People wonder why they had so much scientific knowledge that they did nothing about, but what was the point? Ancient gnosticism encouraged the spiritualising of everything bred non-involvement with real life. Christian theology held that the world did matter and it is fundamentally worthwhile and good, but, after St Paul, stymied and crying out for redemption. It also held that there was a sense in which Creation was ongoing and incomplete. By articulating the paradox of a crucified God, the Christians rejected a simple instrumentalist/controller God, and insisted that whatever the reason, God did not exempt himself from the processes of suffering and evil done to him. Would it have been possible for God to have made a world without a free-for-all of elemental forces at the bottom of it? I suppose not, but I do not know; and there is (I take it) only one Mind that does. Without answering any such question, I can be convinced that this actual self-making world of ours expresses the will of a Creator; and equally without answering it, I can thank God heartily for my existence. This view has inspired all sorts of people to get stuck in and try and bring healing and help, but with a painful awareness of their own shortcomings at times. Classic nineteenth century atheists, following Huxley and Spencer, decided nature was utterly random and impersonal and that's all there is to it. The task of the human race was to make the most of the hand evolution had dealt to improve the human race (Eugenics). Unfortunately the atheists didn't have any framework except a pale memory of the Christian morality around them to say what was good or bad — what right had one bundle of random atoms to critique the behaviour of another random bundle of atoms? For a generation or so middle class niceness kept the Eugenic quest within roughly the historic Christian ballpark, but before long Eugenicists created their own problem of evil — social Darwinism as expressed at Auschwitz. I would be very interested to hear Steven's explanation for evil, as we encounter it in nature. If the question is really 'Why should I believe in a God who designed a world in which suffering happens?' then the answer is that no-one is saying you should. We have free choice. Questioning God's design of the world is a fairly Western, post- enlightenment occupation - looking at God as the object of our judgment, rather than vice versa, is a fairly new idea. Of course one classic apologetic answer is that if we put God on trial and condemn him to death for our sufferings, then he has already paid the price in the death of Jesus - but that doesn't make much sense to people who don't believe in Jesus I would guess. In fact judging faith on the basis of rationality is a bit of a non- sequitur anyway. Beliefs are usually based on experience and/or trust in the person who is telling us something. "the act of purposefully antagonizing other people on the internet, generally on message boards." - as well as other more trenchantly expressed but essentially similar definitons. I guess as this is called 'Bishop Alan's Blog' then he gets to say which posts he thinks are trolling on it! Thanks, Pam for your contribution. POndering these things, I don't think of "Creation" in the way deists did in the 18th century, in other words as a finished bit of machinery. Following ancient Christian traditions about "Soulmaking" I tend to think of it far more as a dynamic/ emergent/ relational reality. That seems to me the implication, among others, of the Book of Job. I will be veryinterested to see Steven's considered view of why natural disasters happen, in this column. Intellectally speaking, the critical issue for Christians to ponder is "Love almighty and ills unlimited — how could a God of love make a world where evil happens?" For atheists the critical issue is "If the world is simply an impersonal thing that just happened and that's all there is to it, why do any of us random bundles of atoms care about evil enough even to define it as such? One lot of atoms gets killed; why, in a wholly impersonal secular universe, should another lot of atoms have to care, apart from being glad it wasn't them?" I'm looking forward to seeing Steven's answer to this issue here. If he doesn't give it, of course, it proves he was just trolling in the first place... as he has been known to do on numerous occasions on various blogs around the place. If he wasn't just trolling on this occasion (and one's tempted t say it would be a first), I apologise to him, and will be interested to ponder his thoughts. The explanation for evil is quite simple. Stuff happens. Sometimes it helps human beings. Sometimes it hurts human beings. But such Biblical viewpoints are no longer fashionable among Christians, who know that a metaphor of God as a Shepherd struggles to ecompass the reality of a Shepherd who lets his sheep be drowned, but cannot think of a better metaphor. Atheists, unlike this imaginary god, can tell the difference between one lot of atoms formed into the shape of a sentient suffering being, and one lot of atoms formed into the shape of a rock. Unlike this alleged god who allows both rocks and babies to be smashed to smithereens by a tsunami, almost as though the fate of a baby and the fate of a rock had equal worth in his eyes. It would also not make much sense to the author of Luke/Acts who responded to the death of Jesus by adding 'deicide' to the list of humanity's crimes for which they must repent. God is not on trial. There is no Good Shepherd who is on trial for neglecting his sheep. A Shepherd who allows 250,000 of his sheep to drown is a shepherd who doesn't exist. We should not forget that the commandant of Auschwitz was a Catholic. And that God passed by on the other side when children in gas chambers screamed to him to help. It is interesting that Bishop Alan thinks a bundle of atoms only has value if God gives it a value. I have a bundle of atoms in the shape of Monopoly money. He has bundles of atoms in the shape of 10 pound notes. As God did not create 10 pound notes to have more value than Monopoly money, then Bishop Alan should have no objection to swapping one bundle of atoms for another. After all, both 10 pound notes and Monopoly money are bundles of atoms, both valueless unless there is a god to give them value. We atheists might think 10 pound notes have more value than Monopoly money, but a Christian would never fall into the trap of thinking one bundle of atoms had more value than another, unless God had given them a value. Or does Bishop Alan think purely human values are real values and that 10 pound notes have a real value that Monopoly money lacks? "And that God passed by on the other side when children in gas chambers screamed to him to help." make - since there is no God to pass by? Either your argument is with God - in which case you are not an atheist - or it is with people who believe in God. Or the third option is that you don't have an argument at all, you just want to get everyone mad at you to show that Christians are just as capable of human reactions as everyone else. Which isn't actually in dispute anyway. My beliefs have been worked out over quite a long time, if you want to understand them then the best starting point isn't really 'You;re wrong and you know you are' is it? If on the other hand you don't give a stuff about what I or anyone else believes, then why should anyone else give a stuff about what you (don't) believe? In any case, I don't believe you seriously expect a rational debate in response to posts where you apparently can't be bothered putting together a coherent argument without great big holes in the logic. It takes two and all that. Thanks, Steven, for pitching in with something. You seem just to be saying that stuff happens, and you personally wabt to tell the difference between different kinds of bundles of atoms, because you choose to, and that's that. The question I was asking was *why* in a wholly materialistic universe, any of this matters in that kind of way. I don't think I'm the faintest bit convinced about your answer so far, for the reason Pam gives, among others. Also because a crude instruemntalist view of God as someone who "exists" as an entity within the world is a long way from Calssical (Aquinas) Christian theology. If there was a Catholic Commandant of a death camp, by doing what he did he would be denying a central plank of his Catholic faith. If, on the other hand, saind commandant had been an atheist Eugenicist, he would have been doing exactly ahat his philosophy required him to do, and expressing the purpose for which those places were designed. That's a great difference. Without Spencer, Huxley, Houston Chamberlain, Gobineau, the whole "inferior races" ideology would not have seemed an ideal. The line is absolutely direct and nothing in their vehement denial of God made any of these people one whit less racist and dangerous. Indeed the fact they believed morality was enitrely subjective inspired them. Darwin himself would have been horrified by Social so-called Darwinism, but its 20th century fruit is inescapable. That's without considering Mr Stalin with his 60 million dead, and all in the name of modern scientific atheism. I should also say, Steven, I do not recognise in your assumptions about what I am supposed to believe about value any attitude I would own or express in the way you project onto me. It is exactly because we are expressions of the mind of God, created beings, that I believe life has real value. To use your money analogy, which I wouldn't but you projected it onto me, I would say the monopoly money is the stuff validated by human reason apart from God, and the real stuff derives its value from acknowledging the reality of God. 'who don't believe in Jesus' What are you really saying? you don't believe in what people claimed about Jesus or that you don't believe in Jesus. If it is the latter then you are going against the evidence. All Steven apperas to be saying is that the problem of evil isn't a problem for him because he denies there's a God. In other words, Fermat's Last Theorem is not a problem if you're don't do Maths. Whilst this is self-evidently one way to deal with the problem subjectively — take evasive action — you've got to be an atheistic true believer before it will strike you as answering anything. In other words, Fermat's Last Theorem is not a problem if you're don't do Maths. Pam is drawing the correct conclusion. If there is a god who tells people it is immoral to pass by on the other side, then said god is immoral to pass by on the other side. And a self-contradictory being cannot exist. In a materialistic world, people can assign value to lots of things, including human beings and money. In a theistic world, God can assign value to lots of things, including human beings but not money, which is man-made. So in a theistic world, how does money get any value? Of course there is no alleged god assigning value to humans, otherwise this god would look after human beings in the way that Bishop Alan saves his money from accidental destruction, if not even more carefully. If there was a Catholic Commandant of a death camp, by doing what he did he would be denying a central plank of his Catholic faith. If, on the other hand, saind commandant had been an atheist Eugenicist, he would have been doing exactly ahat his philosophy required him to do, and expressing the purpose for which those places were designed. As it happens, the first person to suggest that Darwinism justified eugenics was the minister , Asa Grey. It is simply scurrilous hate speech to suggest that the logical result of atheism is the Holocaust. I no more blame Bishop Alan for the deaths of people in the tsunami than the Prophet Isaiah blamed God for creating disaster. I simply point out that the metaphor of God as a Shepherd is a straw-man, and not what Christians really believe about a god who lets people die in their millions from malaria and Spanish flu. Hmm, Monopoly money surely does have a value - you can buy things on the Monopoly board with it! For me, there is no doubt that the world is filled with both good and bad events for people. Yet we're here for only the tiniest fraction of time - just 70 or 80 years perhaps, maybe much less. The rest of all eternity awaits. Yes, dreadful things can happen here, but this is God, and He can undo all problems caused by pain and suffering in the life ahead. Without Him, pain, death. With him, pain, no death, life eternal. Works for me. Well, as much as it can do for one small Aspie brain and no theological background anyhow. Ann, Thank you for sharing your take on this. Steven, I'm afraid I've simply lost the point of your questions about the value of money. Obviously in absolute terms paper money has any value people happen to assign to it. I can't believe you're suggesting people have to be atheists to think money has any value?! Lots of people who are not atheists still use money. The Eugenics movement took various forms, but drawing a link between it and racist ideology is not hate speech at all. It's a simple historical fact. The denial that there was any absolute morality along with any notion that people were of value because they were made in the image of God led some "Social Darwinists" to dreadful places. Atheistic regimes from the last century have plenty of blood on their hands. How could people who began professing such high ideals cause such terrible slaughter? Even if that's not a problem for atheists, it makes nonsense of any notion that being an atheist somehow insures people against abusive behaviour. Lots of Christians do, as a matter of fact, apply biblical shepherd imagery to God: I've no idea what makes you simply deny they do this, but it's hardly their problem — just a matter of your blinkered understanding. Steven, do you know that you're putting words into people's mouths and setting up 'straw men' to win your argument (in your own eyes anyway.) Do you care? If it's 'scurrilous hate speech' to suggest that the logical outcome of atheism is the Holocaust, why is it OK to suggest that Christians wilfully believe in a God who doesn't care about suffering and that they are simply lying about God being a Good Shepherd? And are you really incapable of understanding that, if your basic point is that God doesn't exist, then talking about the nature of God is an illogical? Or are you just setting out to disprove your own statement that 'a self contradictory being can't exist'? Of course, many Christians of today are busy trying to remove the negative associations with which the word 'genocide' has become encrusted since the time of Auschwitz. Marcus Honeysett explains the Christian response to evil - kill the evil people. Steven I really simply don't get your statement 'many Christians of today are busy trying to remove the negative associations with which the word 'genocide' has become encrusted since the time of Auschwitz' Are these Christians made up in your own mind or what? No, they are not made up. I gave links so you can see them in action. And are you really incapable of understanding that, if your basic point is that God doesn't exist, then talking about the nature of God is an illogical? Ask your teacher to explain it to you. Thanks Steven, for the reference to Marcus' blog, which I hadn't come across and contains some really interesting material to explore soon. I suppose one way of being a True Believer Atheist is just to piddle about with religous concepts, texts and language to the depth that allows you to set up a few soundbites as straw men and pee all over them, but without engaging with them on any other level. It reminds me of a discussion we had last year where you baldly asserted that all commentators dismissed a particular text as non-Pauline. I went to the Bodleian and found 12 commentaries which said the exact opposite and none at all that substantiated your view about what all commentators said. From this I learnt you operate to a fertain depth, and that's it. This procedure says nothing at all about religion per se. What it actually means is "I have a pathological hatred of all religion (except my own atheism), so I don't have to engage with it in the way other people do." Classic Fundamentalist technique. It's a free country, so why not? Still no actual arguments from Bishop Alan about why the Good Shepherd does not look after his sheep as carefully as Christians look after their money. ...where you baldly asserted that all commentators dismissed a particular text as non-Pauline. Never did any such thing. I never said 'all' commentators. It is hard to believe that Paul wrote that God's wrath had fallen upon the Jews. Why, God is a 'Good Shepherd' , not a wrathful person who inflicts disasters on Jews. Steven. thanks for the references which you didn't give last year. I happen to have Brandon (whose general thesis about the fall of the Jerusalem Church is very interesting and did tend t close the gap between historical events and datings of NT books, but never gained general acceptance). His suggestion about this passage made in 1950 has never been taken up much, partly because Romans is usually taken as mpst characteristic Pauline and the argument of the first half is exactly that God's wrath has been revealed against all, Jew or Gentile. It was given another canter round the paddock in 1971 in the HTR, but again, without anything but nodding acknowledgment. I have no idea where you got this thing about how carefully Christians look after their money. In my experience Christians, apart from (anecdotally) a probably greater propensity to give it away, have a whole variety of ways of handling their money. As to your basic question I do not accept that natural disasters are either, as you suggest above, no problem, or else personal instrumental inflictions by an actor on the human scene called God. That is not what is meant by God existing, where my sense is closer to the Farrer quote I gave above. I am sorry Steven I couldn't find any links that supported your statement just a link to a interesting blog that I guess is vaguely related to this discussion. Glad to have discovered your blog, Alan. I've enjoyed a brief blog dialogue with Steven today, but been sad to find someone quite so prepared to wilfully misrepresent just about everything that the person on the other end of his scorn says. It seems to me that astonishing hyperbole and deliberately inverting what others say in misleading ways are part of his armoury. I am equally saddened that anyone can try to silence your analytical comment on the connection between denial of values, eugenics and holocaust with such a terribly loaded term as "hate speech". I am surprised anyone would still expect you (or any reasonable person) to engage with them after such venom. Especially from someone who themselves on my blog earlier today equated Christians with Nazism. If your comment is hate speech, that certainly is. Thanks, Marcus. I've been glad to discover your blog, with its associated network, and grateful to Steven for the lead! I have to acknowledge your description of arguing with Steven as painfully accurate. Standing back from this whole discussion, it may be our experience of God as Trinity is relevant. God, from whom proceeds all, dynamically, in real time, we see as Father or origin. Creation is dynamic and creative — an unfinished novel in which there is room for all sorts of provisionally but genuinely good and bad things to happen. This is a world in travail. The OT shepherd promises are focused on Jesus, who comes among us as one of us and accepts the place of a suffering servant. Accepting the limitations of being within creation is not necessary, and sometimes this dividing line bends and dissolves, but in principle that is the place from which he comes to us. None of this says why it should be, but it's a complex description of how it is which doesn't (as above) pretend there isn't a problem, or lose hold of the essential primal and eventual resolution of everything in Christ.